The first experience I had with Krishna consciousness was when a friend of mine had got a small book, Perfection of Yoga, on the Atlantic City, New Jersey boardwalk. At that time I was going to college at Rutgers in New Jersey and was home for the summer. I was also doing Yoga exercise daily so I was immediately interested in reading the book. I picked it up and read 5 or 10 pages and then put it down thinking this is not Yoga. At that time I though that yoga was physical and breathing exercise. Several months later a friend of mine in the fraternity that I was staying in at Rutgers told me since you are so much into George Harrison you properly will want to read this book that I got in Port Authority in New York City. The book was Nectar of Devotion by His Divine Grace A.C. Bhaktivedanta Swami Prabhupada, Founder Acarya of the International Society of Krishna Consciousness. I glanced at the book quickly and though yes I have to read this book. Maybe about a month later I needed to write a paper for school and since I really hated doing this I took some speed (uppers) to help me out. I quickly wrote the paper and then tried to go to bed but couldn’t fall asleep because of the drug. Around 11:30 pm I picked up the Nectar of Devotion and started to read it. I read about 200 hundred pages reading all night until the next morning. 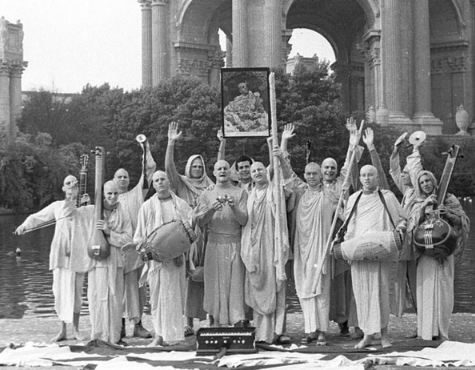 I remember reading where Srila Prabhupada described the bliss of a devotee was unlimited and that there was a simple process which was to simply chant Hare Krishna. I though that Srila Prahbupada was not only was speaking the absolute truth, but was the first person I had ever met who had ever said that what he was saying was the absolute truth for all circumstance. He was totally convinced that he was presented the absolute truth and I had never met anyone who had done that. Everyone else just had theories. I became totally convinced that the path he was describing was the way to total happiness and was the ultimate truth. Srila Prabhupada described in Nectar of Devotion many processes that a person should follow in devotional service. He described that a devotee should be a vegetarian and clearly defined why they should be a vegetarian. I though this was a great concept but how could I actually do this. Of course he had an extremely simple solution and that was just to chant the Hare Krishna Maha mantra. I immediately took up chanting at first chanting using a comb to count the mantras. A few weeks later I got some japa beads from a local yoga studio in downtown New Brunswick. I chanted for a few months and became a strict vegetarian naturally without even thinking about. As the Nectar of Devotee did not have the address of the ISKCON temples in it I was not sure where any temples were. One day I went over to a fraternity to visit a friend of mine. When I went up to the second floor I saw a magazine lying on the floor and picked it up and realized to my great delight that it was a Back to Godhead Magazine. I looked at it and realized that it had a list of temples in it. I though in my mind it is unbelievable that such a valuable thing as the BTG was lying on the floor of the fraternity and so many people just walked by it like it was trash, when in actuality it was the most valuable thing in the world. A few weeks later when I was having a really bad day I though I got to go move into the Hare Krishna temple and experience the bliss. I went out to my car to drive to New York to go to the temple. But the battery of the car was dead and I decided to not go. A few weeks later a friend of mine told me that some devotees had come to the school and were chanting in the Student Center. I immediately went to the Student Center and watched the devotee chanting. I started talking to Bhakta Bob (Bindu Madhava Dasa) and then he told me you have to talk to these two senior devotees and should take prasadam food. I ate the Prasadam which was cooked by Visnugada who I have always considered to be one of the best cooks in the movement and though this is by far the best food that I have ever tasted. I also sat and talked with Visnugada for a while. The devotees immediately wanted to take me back to the New York 55th Street temple with them. I told them that I had a few things to do that day but could go to the temple in a few days. The devotee in charge told me that they would come back to pick me up a couple days later and got my phone number. I purchased a Bhagavad Gita, japa beads and a bead bag, and a few other books. A few days later I received a phone call and a devotee told me that they couldn’t come back because the bus had broke down. I just continued to chant and since the devotees had explained to me how that ideally I should chant 16 round a day I started to do this and regularly read Srila Prabhupada book. I read the Bhagavad Gita several times. But I could not quite get it together to get to the temple. On Halloween I took a massive amount of LSD and there was a large LSD party at the school. Around one or two in the morning it I couldn’t fall asleep so I just chanted and read Srila Prabhupada books. I though this is the perfect time to go to the temple but I could not go until it got daylight. I though I know I can’t go to sleep or when I wake up I would not go to the temple so I stayed up all night. I went to the train station and got a train to New York. When I came out of the train station I got a taxi to the temple. When I walked into the temple there was incense burning and I went into the temple room. It was the most blissful experience I ever had and I really felt the bliss that Srila Prabhupada had talked about. Bhakta Bob who I had met at Rutgers walked up to me and greeted me. I told the devotees that I wanted to stay. Bhakta Bob then brought me up to speak to the GBC for New York Adi Kesava Maharaja. We spoke for a while and he told me that you have to speak to the best and most humble devotee in the temple and that he would take care of me for the next few days, Jayananda Prabhu. Jayananda Prabhu then came and started to talk to me. I told him that I was up all night. He then brought me upstairs and told me that I should go to bed and that he would wake me in the afternoon to go out on the Saturday night Harinama Sankirtana in Times Square. In the afternoon he came and woke me up and I went out on one of the famous New York Temple Harinams. We came back to the temple and I took some milk Prasadam with Jayananda. That night I stayed with another Bhakta and was woke up the next morning. Jayananda Prabhu personally took care of me that morning explaining to me everything that I should do. He told me that I should sit with him and chart japa. He noticed that I was chanting very quickly and he told me to take the beads out of the japa bag. He noticed that I was moving the bead forward unconsciously while I was chanting moving two or three beads forward during each mantra. He told me I should firmly hold onto each bead as I chanted each mantra and should clearly chant each mantra so I could hear it within my heart. I then did service with him all day. We cleaned and polished the Deity paraphernalia and did other things that day. During the entire day he gave me instruction in practical Krishna consciousness. During the entire day he preached to me how a devotee should act and as it was my first few days in the temple I felt I was shown by Krishna how a true devotee should really act, but practical example. He only spoke about Krishna, did service and never criticized anyone. He was the most respected devotee in the temple. The next morning (Monday) when I woke up I decided to go back to Rutgers and finish some things that I was convinced I needed to do. I told the devotees I was going to leave and they brought me to see Tamale Krishna Maharaja. He then sat me down and he preached to me for a while and then he thought actually I think the best thing for you is to stay with Jayananda and as he is the best association that any devotee could have he will really help you develop proper faith in Krishna. Regrettably I did not stay and did not get this extremely valuable daily association in 1976. But at least I got the association for a few days of the devotee that I always felt to be a the best true leader and true example of what a devotee should be, as he led by example. I felt at that time that the devotees treated me like I was special, which of course I could not understand. But at least I was lucky enough to get the best association when I first came to the temple so I did feel like Krishna had treated me special.